A week in politics’ is said to be as long as year in the Roman legion! Talk this week is about whether Julia Gillard will remain as the Nation leader. That’s nothing new! This speculation has been going on since August 21st 2010, when Australians last voted. The Electional chart for that day as I suggested and commented on many times would bring about a confronting debate on all matters governing the Nation, including its leader. Recapping briefly on this event chart which I set for Sydney @ 8:00am, the opening of the polls. The Ascendant was 00:31’ Libra, MC 00:16 Cancer. Saturn was conjoined to the Asc at 02 Libra, opposed by Jupiter at 02 Aries upon the Dsc. The two Significators of the 1st and 7th houses were Venus and Mars. Both these planets were conjoined at 13 degrees Libra in the 1st house. The Lords of the 10th and 4th were Moon and Saturn. In the fourth house was Pluto at 02 degrees Capricorn along with the North Node at 11 and Moon at 16 Capricorn. The South Node was 11 Cancer in the 10th house. This Cardinal dynamic ensured a continuous crises would be played out every 29.5 days, the length of a Solar/Moon lunation cycle. Furthermore as the planets moved around the Zodiac (Sun) their entry into Cardinal signs would also further trigger this crisis. I also made mention in several articles the significance of the 11 degrees of Cancer/Capricorn. 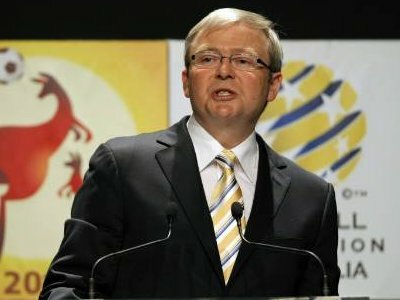 Rudd was elected on November 24th 2007 with Mars at 11 degrees Cancer and the Moon at 20 Taurus. We just had a Solar eclipse at 20 degrees Taurus on May 10th 2013, this eclipse also saw Pluto at 11 Capricorn and the Ascendant degree for the chart set in Sydney was 8 degrees Cancer. The influence of a Solar eclipse is said to equal two factors; The sign rising and the Lord of the eclipse, which in this case was Venus at 00:28’ Gemini. Both these signs are short in terms of how long their effect will last and when and how the significance of their action will be felt. Following this eclipse on May 31st, Mars ingresses into Gemini. This ingress chart for Mars has some correlating factors with regards to this story. Firstly Mars arrived at Venus’s eclipse degree and Mercury arrived at 00:14 Cancer. These two planetary actions set the stage for the following actions to announce themselves. Speculations once again rose about a leadership challenge by K. Rudd. These actions were further boosted by a continuing failure by Gillard to make any ground in the New Polls; the Labor Party is heading for a wipe-out according to the Polls and Media. What else is fuelling this action is the current Solar lunation cycle, on June 9th a new moon occurred at 18 degrees Gemini and a full moon will culminate on June 21st 2013. The new moon has seeded the next chapter in this epic play with Mercury at 11 degrees Cancer and Uranus at 11 degrees Aries and Pluto at 10 Capricorn. All of this conjecture and continuous scandal mongering can as well be seen when a composite of these charts are referred back to the Australian Federation chart. On January 1st 1901 the Australian Federations investiture was in acted with the Swearing In of the First Governor General Lord Hopetoun. This took place in Centennial Park and was investigated and Timed by the Late Gwen Stony. The time Gwen and her assistant Tex Cox produced through their vigorous investigation was 13:35:42 AEST, Sydney. This chart has the Sun at 10 degrees Capricorn with Saturn at 7 degrees Capricorn. The full moon on June 21st will know doubt bring all of this to colourful climax as the Sun will arrive at 02 degrees Cancer and Moon at 00 degrees Capricorn. This will see the original election chart of August 21st set in action. The new moon chart of June 9th had the MC at 16 degrees Capricorn, which was the degree of the moon on August 21st 2010. Well the planetary correlating patterns are not yet over as Jupiter will ingress into Cancer on June 25th, with Mars arriving at the June 9th new moon degree, furthermore Mars will arrive at Gillard’s natal Moon of 15 Gemini on June 17th the same day also see’s the transiting Moon at 27 Virgo. This is Rudd’s Sun degree. Will we see bloodletting? Well again the following Sun/Moon Lunation will be at 16 degrees Cancer on July 8th, so all this should settle the long running epic tragedy which we remember began on June 26th 2010 Lunar eclipse at 04 degrees Capricorn with the Moon conjoined to Pluto.